The play is structured as a series of vignettes that sometimes weave together. A young couple, Sandy (Rora Brodwin) and Ed (Brian Joél Sanchez) get married and decide to start a family. Their plans are complicated when Sandy becomes pregnant with triplets, and they don’t have enough elderly relatives to offset their three babies. Lenore (Alexandra Kumala Moerdomo) appears to be happy and successful working at one of the centers, but looks can be deceiving. A painter (Kadence Neill) works on a mural meant to celebrate Dr. Swift and other prominent leaders. The play often transitions between story lines with propaganda songs, commercials, and political advertisements, which are performed by the whole ensemble. Pop culture is full of memorable dystopian futures, from George Orwell’s 1984 to Lois Lowry’s The Giver, and Suzanne Collins’ The Hunger Games. In theater alone, there is the garish nightmare of Repo! The Genetic Opera, the smartly satirical Urinetown, and the divisively meta Mr. Burns, a Post-Electric Play. They explore issues like medical debt, smart consumption and conservation, and the stories and values that endure when the world has ended. Most of these stories are obsessed with the idea of self-preservation, so I was intrigued by the concept of a society that valued suicide. This is where A Modest Proposal stands out as unique among these other dystopian stories. The popular culture and values are established through propaganda songs that frame suicide as patriotic, romantic, and necessary. Composed by Emily Erickson (who also served as the show’s vocal coach), the music is well-written and performed admirably by the cast. Despite this interesting angle on preserving life, A Modest Proposal lacks a clear point of view on this future, and the characters aren’t memorable. The characters in dystopian stories are often written as simple archetypes because the focus is on the bigger ideas. When people think of 1984 and Fahrenheit 451, they think of Big Brother and burning books, not Winston Smith and Guy Montag. However, A Modest Proposal doesn’t have the same confident perspective, so instead of feeling shocked by what unfolds, I was left shrugging and wondering why I should care. Another major problem with the show is the performance style paired with the space. The Cherry Lane Theatre is an intimate space. The last row is closer to the actors than the orchestra seats in most Broadway theaters, so the audience can pick up on subtleties. Unfortunately, the cast is acting to the back row of a much bigger theater. On a scale of 1 to 10, the actors are at an 11 or 12, when a 6 or 7 would be more than sufficient. I don’t blame the actors, since they are consistently at the same intensity, but I put this on the directing. Also, it left me feeling fatigued since there wasn’t enough variety of highs and lows throughout the show. In the story’s most intense moments, I wasn’t thinking about the drama unfolding but the volume of their screaming and emoting. 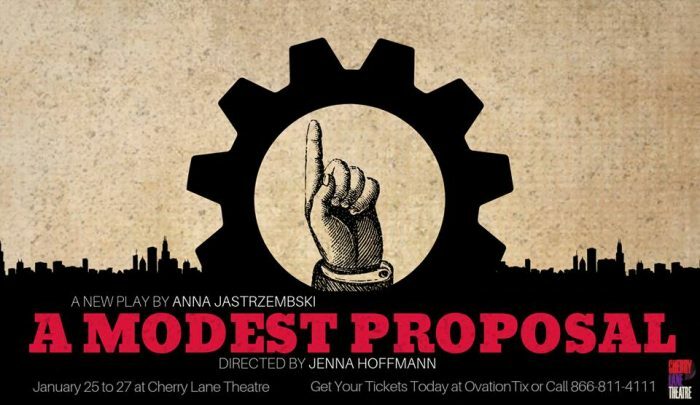 A Modest Proposal was a missed opportunity to subvert self-preservation in a over-populated world. It could still reach that potential with rewrites and more readings or stagings. Until it decides what it really wants to say about the future of humanity, it will be stuck in a world that is bleak but not particularly enlightening.